Evolution? Or revolution? It’s the conundrum every automaker faces when redesigning a best seller. You want to keep your loyal customers happy, but you don’t want to make them feel like they’re driving yesterday’s car. Evolution? Or revolution? The 2020 Range Rover Evoque answers with an each-way bet. The exterior is a smoother, sleeker, more reductive take on the existing Evoque’s pert proportions. Evolution. But the coolly minimalist interior, with its state-of-the-moment technology and haute couture materials, signals the Evoque is now a genuine luxury SUV in its own right, rather than simply the cheapest way to get behind the wheel of a Range Rover. Revolution. 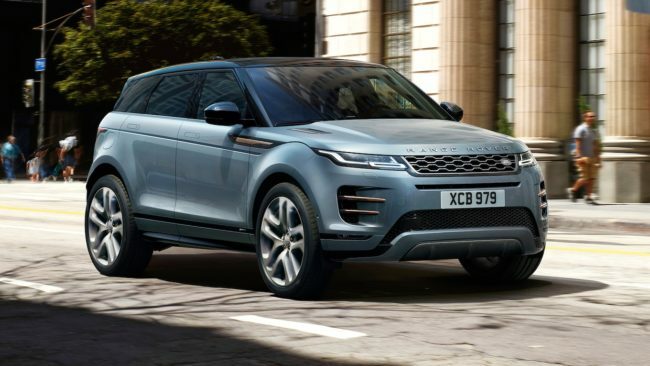 The 2020 Evoque has been designed from the wheels up to be more efficient, more refined, and roomier. Jaguar Land Rover wants the new Evoque to deliver more of the character beloved by the almost 800,000 customers worldwide who’ve bought one since the baby Range Rover first went on sale in 2011, but also to surprise and delight in new and meaningful ways. No easy task. Which explains why the automaker has invested about $1.3 billion in bringing the new Evoque to market, including a $140 million upgrade of its Halewood, England, manufacturing plant to ensure its top-selling Range Rover can be built more efficiently and to higher quality levels. Although European buyers will be able to opt for diesels, U.S. market Evoques will only be offered with gasoline powertrains. The entry-level P250 features a 246-hp version of the 2.0-liter Ingenium four-banger, while the P300 is a 48-volt mild hybrid (MHEV) Ingenium variant that pumps out 296 horsepower. Both engines drive through a revised version of the ZF nine-speed automatic transmission. The outgoing Evoque interior looks like something out of a well-specced mid-priced hatchback, the poor relation of the Range Rover lineup. The 2020 Evoque interior, by contrast, is every bit as stylishly luxurious as those of its bigger, more expensive siblings. It has the sleek dual touchscreen interfaces first seen on the Velar—the infotainment system is both Apple CarPlay and Android Auto compatible—and the 12.3-inch TFT instrument panel is now available as an option. This new Evoque amps up the concept-car exterior style, adds an interior with modernist luxury flair, and throws some impressive 21st century tech into the mix for good measure. If it drives as good as it looks on—and off—the road, and delivers the promised improvements in refinement and efficiency, it’s going to be a home run.